The surrounding exterior walls of the conference center in the new building of the Federal Ministry of Education and Research are to be designed artistically. The innermost space at the center of the building provides a view of the river Spree in addition to an overall view of its interior space. The basic idea behind the design concept, is the term Black Box which has its roots in the language of the theater and symbolizes empty space, space to concentrate on the free word as exemplified in free and independent speech and innovative and open discourse. Free and independent thinking is the foundation for any successful education and research. The flow of thought is projected onto the exterior walls of the Black Box reflecting at the same time, the motif of the river Spree. Black Box—Black surrounds all four walls of the conference center, clearly highlighting the volume so that the surrounding space appears larger and more extensive. The architectural idea of an innermost space within the overall space is picked up artistically and super-elevated. The conference room receives a distinctive face and provides a clear spatial orientation. 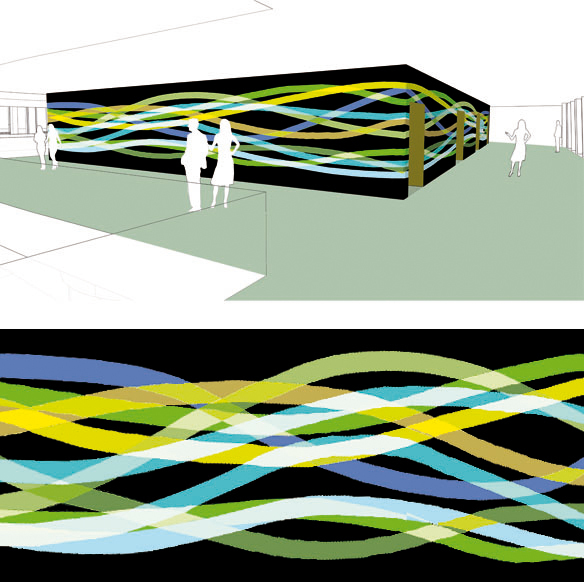 Flow of thought—The free flow of speech in the interior of the conference room is reflected on the exterior walls of the Black Box. Colorful bright lines move continually along the walls of the matte black volume. Their concentration in the interior is visibly condensed and projected towards the outside. At the same time, one experiences the illusion of a river, of the tributaries of the river Spree, which can be seen through the windows. The Black Box provides a free space for sensuous experience during the flow of thoughts.